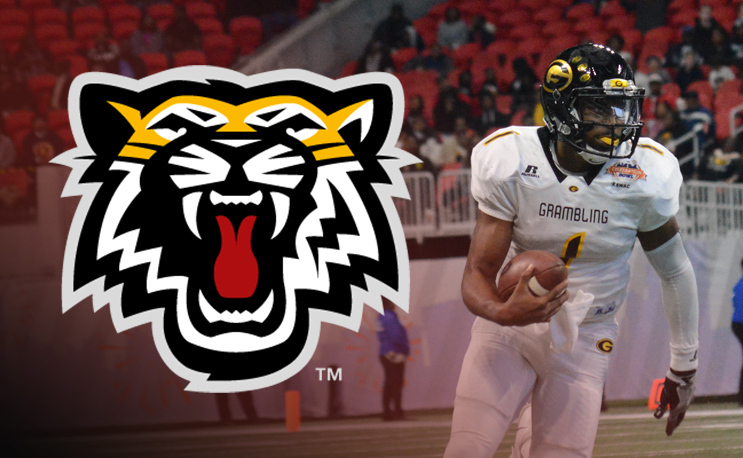 Grambling State’s DeVante Kincade hopes to have found a home in the Canadian Football League. DeVante Kincade is hoping to have found a home in pro football. The former Grambling State Star and two-time SWAC Offensive Player of The Year has signed with the Hamilton Tiger-Cats of the CFL, the team announced on Tuesday. Kincade isn’t a stranger to the organization as he joined the team as a member of the practice squad last fall. The 6-1, 190-pound native of Dallas, Texas led Grambling State University to an 11-2 record and their second-consecutive Southwestern Athletic Conference Championship in 2017, completing 217-of-368 passes for 2,905 yards with 23 touchdowns and four interceptions. In two seasons with the Tigers (2016-17), Kincade threw for 6,011 yards with 56 touchdown passes and 11 interceptions, rushed for 811 yards on 228 carries with 12 rushing touchdowns. He led Grambling to a win in the 2016 Celebration Bowl and helped the team earn the black college football national championship that season as well. Kincade started his career in the SEC at Ole Miss before transferring to Grambling. Lady Tigers beat Southern for first SWAC series win since 2015. Grambling will make its first postseason appearance as a Division I school this week.